We all have spiritual helpers that wish to guide us along our path in this life. These relaxing meditations will help you connect with their guidance and loving support, releasing you from fear and providing you with valuable insights. The higher self is the part of your spirit that stays on the other side of the veil. Like a veil you wear on your face, the veil hides your real identity, that of your spirit and your real home. As you raise your frequency and follow the spiritual path, over time your connection to your higher self becomes stronger. When you are spiritually ready, a part of your higher self merges with your human spirit allowing more of your spirit to shine through you. When this connection is made, you tend to feel less alone, more at peace, experience better health and experience living in the now more often. Your ego gradually takes the back seat and your spirit takes the drivers seat. You also have master teachers that are not a part of your higher self, but wish to assist you on your path. These can be departed loved ones, ascended masters whom have also walked the earth plane and even animal spirits. We all have an entourage of spiritual helpers that wish to guide us along our path. An introduction about the concept of this spirit guides album. The higher self is explained and how our higher self and spirit guides function as a support system in our life. Some insights are given on how following a spiritual path will transform our lives, allowing us to live happier more fulfilling lives. 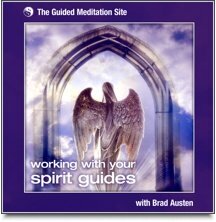 In this meditation Brad takes you through a visualization to allow you to connect to your higher self and receiving guidance from it, to allow you to live your life to your highest calling. You visualize yourself sitting under a very large tree. Like the tree branches that extend out reaching for the light, you also have a network of branches connecting you to the light of your higher self. In this meditation, I take you on a journey into a tropical wilderness to meet and receive guidance from your animal guide. You are walking on a path up a mountaintop. You hear a rustling in the bushes and your animal guide emerges. You feel entirely safe and your animal guide is relaxed and happy to see you. Your animal guide has a special message to give you today. The spirit of Gaia is the sacred consciousness of the planet. It knows who are and wishes to assist you on your spiritual journey. In this meditation, you are guided on a journey to connect with the spirit of Gaia and receive guidance to assist you on your journey. You visualize yourself in a beautiful field, surrounded by lush green grass and you feel the connection to Gaia beneath your feet. You feel a gentle breeze blow across your face, and if you listen closely you can almost hear the spirit of the wind.